At West Coast Beauty we provide the best variety of Spa Care essentials including Spa Tools! We supply industry professionals with what they need from brands they can trust for every type of client and every type of treatment. 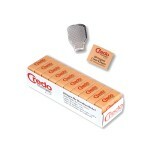 Credo Solingen Blades for Callus RemoverCredo Solingen Blades are replacements for the Credo Solingen Callus Remover. 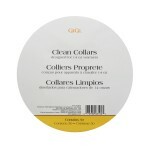 Quantities Available: 10 blades per box 100 blades per box ..
GiGi Cloth Epilating StripsGiGi Small Cloth Epilating Strips are an economical alternative to Muslin Strips, featuring a non-woven design for use with all soft waxes. Perfect for small areas like face and bikini. GiGi Large Cloth Epilating Strips are an economical alternative to Muslin Strips, featuring a non-woven design for use with all soft waxes. 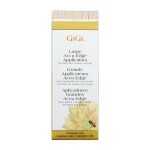 Perfect for large areas like arms, legs, chest..
GiGi Large Accu Edge Applicators (0420)GiGi Large Accu Edge Applicators are the first applicators designed specifically for waxing. Size: 100 pkSkin Type & Condition: For bikini line & body waxing. 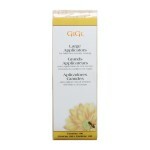 Perfect for large areas like arms, legs, chest and back.Features & Benefits: The precise, angled edges ensure proper placement of wax for an even, controlled application every time reducing the change ..
GiGi Large Applicators (0410)GiGi Large Applicators are sanitary, disposable applicators for use with our high quality waxes. These treatment applicators are the choice of the seasoned professional, as well as the beginner. Perfect for large areas like arms, legs, chest and back.Size: 100 pkSkin Type & Condition: For bikini line & body waxing..
GiGi Mini Pro Kit (0140)GiGi Mini Pro Kit is the ideal starter kit for the novice or the price conscious professional. The kit contains all the necessary waxing essentials for a complete professional service. When you are ready to expand your salon menu to include profitable waxing services, the GiGi Mini Pro Kit is the perfect choice.Size: 1 KitIncludes: Wax warmer with cover 14 oz. 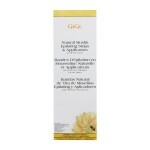 Cr&egrav..
GiGi Natural Muslin Epilating RollGiGi Natural Muslin Epilating Rolls combine a fine grade texture for maximum absorption with an aesthetically-pleasing, clean appeal. Size: 100 Yards: 2.5" x 100 yards 40 Yards: 3.25" x 40 yardsSkin Type & Condition: For all soft waxes Features & Benefits: Can be cut to size for full body waxingUsage Instructions: For professional use..
GiGi Natural Muslin Epilating StripsGiGi Small Natural Muslin Epilating Strips combine a fine grade texture for maximum absorption with an aesthetically-pleasing, clean appeal. Perfect for small areas like face and bikini GiGi Large Natural Muslin Epilating Strips combine a fine grade texture for maximum absorption with an aesthetically-pleasing, clean appeal. 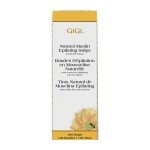 Perfect for large areas like arms, l..
GiGi Natural Muslin Epilating Strips & Applicators (0680)GiGi Natural Epilating Strips & Applicators Combo offers both products in one convenient package. 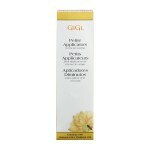 This is the perfect item to pair with GiGi Microwave Wax formulas.Size: 1 Combo KitSkin Type & Condition: For all soft waxes ..
GiGi Petite Applicators (0415)GiGi Petite Applicators are sanitary, disposable applicators for use with our high quality waxes. These treatment applicators are the choice of the seasoned professional, as well as the beginner. 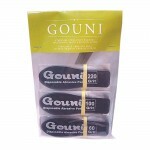 Perfect for small areas like eyebrows.Size: 100 pkSkin Type & Condition: For facial waxing..
Gouni Ella GritDisposable Grits Available 60 Grit: Coarse - for larger areas fo dry and callus skin 100 Grit: Medium - perfect for the Spa Pedicure 220 Grit: Fine - finishing touch for smoother feet Size: 100 pc..
Gouni Starter KitSafe and easy to use, high quality stainless steel. 60 Grit: Coarse - for larger areas fo dry and callus skin 100 Grit: Medium - perfect for the Spa Pedicure 220 Grit: Fine - finishing touch for smoother feet Includes: 1 Foot paddle 10 x 60 Grit 10 x 100 Grit 10 x 220 Grit Size: 1 KitNail Type & Condition: Features & Benefits: High quality stainless steel paddle Comfortable ..
MEHAZ Brow & Moustache Scissors (#19841)Perfect scissors for keeping moustache and eyebrows in shape. 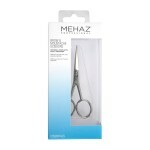 Nickel-plated.Size: 4"Features & Benefits: Sharp pointed blade for easy trimming Pointed tips for precision cutting Premium grade nickel plating.. 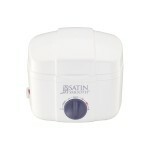 Satin Smooth™ Compact Wax WarmerThis state-of-the-art Professional Wax Warmer offers 12 temperature settings to let you guarantee every client a customized and comfortable depilatory experience. Fits most brands of 14-16 oz. waxing cans and heats the wax quickly and evenly, with a single On/Off switch to make it easy.Features & Benefits: 12 temperature settings Indicator light Comes in a zippered.. 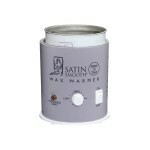 Satin Smooth™ Double Wax WarmerSatin Smooth state-of-the-art Double Wax Warmer brings premium Satin Smooth™ Waxes to just the right temperatures for any and every area of the body including face, legs, arms, and more. Comfort is the secret to your success; use Satin Smooth Professional Double Wax Warmer to ensure thin, even spreading and an ultra-comfortable waxing experience for your client.Size:.. Satin Smooth™ Hydrasonic® Professional Dermal Cleansing Technology KitSatin Smooth introduces HydraSonic®, a sonic cleansing brush that is the essential first step in a healthy skin care regimen. 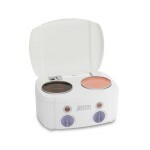 The sonic motion gently yet thoroughly removes makeup, dirt and oil, 14x better than manual cleansing. 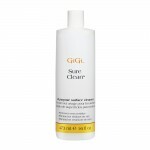 Skin feels and looks smoother, pore size appears minimized, and oily areas, dry patches and blemishes.. Satin Smooth™ Single Wax WarmerA salon and spa essential, Satin Smooth Professional Single Wax Warmer uses state-of-the-art engineering to heat wax quickly and evenly. It fits most brands of 14 oz. wax cans and features a quick-touch On/Off switch, a 10-setting temperature control to maximize client comfort, and a matching cover to help keep wax at the temperature you select.Size: 7.88" (L) x 8.25..